If I had a dollar for every time I heard a woman say that I would give it all to funding a cure and there probably would be a plaque in my name given back to me. When I give an opinion my friends and husband always say “Tell us how you really feel Carole!” I am upfront, I am outspoken, and I always tell people how I really feel so here goes. Many of us have had children – now that hurts! Maybe some of us have injured ourselves or fractured a bone – that hurts. How about when you walk barefoot through the house and stub your toe – damn that hurts too. 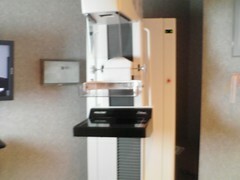 There are so many things that REALLY hurt in life, mammography should not be thought of as one. Let me spell it out for you from my experience every year. I had a lumpectomy and a huge amount of breast tissue was removed from my breast. In inches I lost 1 1/2 wide by 3 inches long and that’s a chunk of tissue. In order to “put me back together” my fabulous surgeon moved what was left around and used surgical clips to hold it all in place. They do not “dissolve” like stitches do. I can see them clearly on my films. When I go for my annual mammogram these clips get squeezed too. So don’t ever whine in front of me and use the word hurt. I am no braver than the next person I just happen to want to continue the life I have for as long as I can because if I was afraid to have a mammogram because it hurts 17 years ago, I would not be alive to day to write this blog or tell people how I really feel. Breast Cancer Support is Everywhere!